We all know there is no real cure for the common cold. According to the Centers for Disease Control and Prevention (CDC), there are more than 200 different viruses, that can lead to colds. And because we are dealing with viruses, antibiotics are ineffective. Absolutely all the medication we take for colds, is meant to combat the symptoms and not the cause. Most people heal themselves without medication within 10 days. Even if allopathic medicine does not accepted their efficiency, natural remedies proved themselves to be very efficient. They help our body recover easier and more quickly, some people say they got cured in a few hours, others say in one, two or three days only. Of course it depends on each body immunity and condition, lifestyle, age and belief. Here are some cold remedies I have found, that people vouch for their efficiency. One of our readers shared with us his way of immunizing and treating colds within his family. He used LGH and managed to keep his children away from vaccines and antibiotics. Here is his testimony: Lemon-Garlic-Honey for colds and immunity. Thank you Phil, for your contribution. • Garlic has some contraindications. See the page about garlic and be sure you don’t find yourself in one of those situations. • After a few doses, some people may experience symptoms like nausea, headache, and mucous drainage. It is a natural phenomenon as toxins are dislodges and the body is eliminating them. It is called the Herxhmeier effect. Like in a major fast cleaning. Still, if it gets too uncomfortable, take a break from the mixture, and then restart with a smaller quantity and see how you feel. People have always found a diversity of remedies, tried them and spread the word. Some of them are quite intriguing and can be prescribed only for adults. For example this remedy: “Mix up 1 teaspoon of honey with a half mug of hot water and add a measure of whisky. Take at night before you go to bed.” Don’ t take too much of it, because too much alcohol inflames the membranes and is counterproductive. And of course, taking this alcoholic remedy we should not take antibiotics or other medicines that prohibit the combination. Whisky is supposed to burn the virus (or drunk it?). The combination doesn’t claim to kill the virus, but combat the symptoms associated, like congestion and sore throats. – 1/4 tsp. of ground ginger. Mix them all and take 1 tsp. every couple of hours. Adults can also use the famous remedy made of coffee and honey to release cough. On the market, there are also drops for the sour throat. The tincture can be used in inhalations, or on honey (or even on a piece of bread, but not in water). · Tincture drops: 20 drops of 20 % propolis mixed in honey, 3 times a day. This means almost 200 mg of propolis per day, which is a good dose, considering the maximum alloed of 1400 mg.
Half the dose for the children. · Tablets: 1 tablet, containing 50 mg propolis, 4-6 times daily. Half the dose for children. 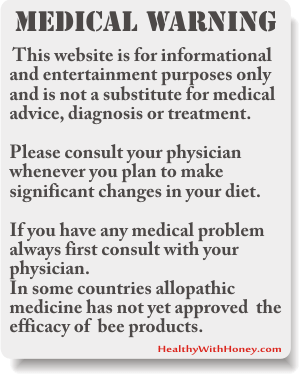 Be careful with propolis. Don’t take more than 1400 mg per day for a 70 kg body, though I can’t imagine why would anybody take that much. After that dose, there is the risk of toxicology. If the cold is associated with fever, and you also notice the following symptoms: slight shivering, headache, body ache, excessive thirst, exhaustion, reduced flow of urine, concentrated urine, increase in heart rate, rapid breathing, excessive sweating, you can try some natural remedies for fever. All 3 remedies are based on the principles of Ayurveda, the ancient Indian science of healing, and are completely natural, non-invasive, and can be prepared at home. Consult your doctor if the symptoms persist. Yet, all herbal remedies are hard to standardize, like it is done with synthetic drugs. There are so many different kinds of honey, which may depend on the geographical region, weather in that year, pollution, etc and the same applies for all other herbs. And even more, the health conditions of the people are so divers, that each one of us will react differently. Don’t expect the same reaction in two different bodies. Rest a lot. Not forcing your body in doing other things, you allow him to concentrate only on fighting the infection and nothing else. Plus that during sleep our body connects to the universe’s energy and recharge itself. Put an extra pillow. Either you can raise your mattress by placing a blanket under it, or simply put an extra pillow so that your head and chest make a slope of 30% with the horizontal. You can put some bricks or thick books under the legs at the head of the bed. This helps draining the mucus. Ensure the humidity in the room. Either use a humidifier, or place some warm wet towels around you. This prevents the membranes from inflaming. Drink a lot of water and tea. Keeping your body well hydrated is very important. Blow your nose. And do it correctly. Press a finger over one nostril while you blow gently to clear the other. Don’t blow too hard, otherwise you risk inflaming your ears as well. Put some warm face packs on your face. Actually they should be placed around the congested sinuses. There are face packs in pharmacies, or you can use some heated salt (cooking salt). Put a teacup of salt in a pan, heat it on the oven, then wrap it in a towel. Or simply heat a towel in the microwave for 20-30 sec. Use essential oils. Put them in an oil burner. They are antibacterial, anti-inflammatory and a lot of other anti-s. And they do wonders. You can use: thyme, cinnamon, basil, pine, fir, eucalyptus. Or place a piece of cloth with some mentholated salve under your nose to help open your breathing passages and restore the irritated skin at the base of your nose. Menthol, eucalyptus and camphor all have mild numbing ingredients that may help to relieve the pain of a nose rubbed raw. Gargle. You can gargle with salty water, baking soda and water, or with a mixture of honey, lemon juice and hot water. Inhale steams. Let your shower run in the bathroom, make a lot of steam, and just stay there till you can breath through your nose. Eat less, drink more. Get more raw vegan, because the vegetables contain a lot of alive energy in them, and you need that a lot. Find balance in your thoughts and feelings. Vanish any kind of inner conflict that you may have. Forget about feeling sorry, doubt or anger on yourself. Watch a good comedy and have as much laughs as possible. 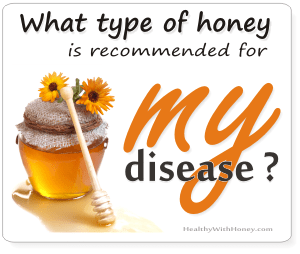 If you know any other remedy that worked for you, especially if includes honey, please leave a comment here and I will be glad to insert it in this website, so anybody can benefit from it. Thank you. On Amazon I have found a very good combination that can be taken during winter to prevent any colds or flues. I do recommend it: Stakich ROYAL JELLY BEE POLLEN PROPOLIS Enriched RAW HONEY 40-OZ – 100% Pure, Unprocessed, Unheated. Garlic – friend or foe? 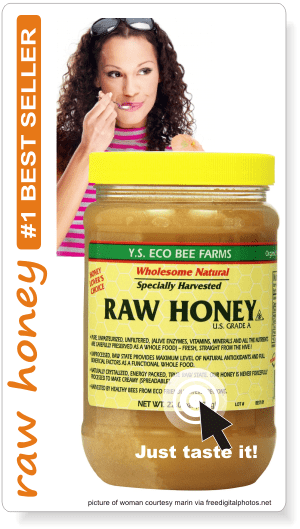 Can honey treat allergy? Is it true? I am going to be to the point. I am stage#4 mesothelioma. Could some type of honey help me in my battle ? Thank you for any suggestion you may have. For mesothelioma the best natural product that comes into my mind is zeolite in its 2 best forms: Clinoptilolite and chabazite. Detoxifies the body from asbestos and helps in fighting the cancer. As for honey, there are some types of honeys that have proved significant good results in cancer, in this article you can see which are those, and some of the studies that analyzed them: What honey is the best for me? Had flu like symptoms usually in the morning for two days already!! Will have to go shopping for a bit though lol… I only have honey with me! You’re welcome to visit us any time. I’ll do my best to help with what I know. If only your sinuses are the problem, then it might be the lack of humidity in your sleeping room. Have you checked that? If you don’t have something to measure it, then try putting some wet towels in the evening in the room and see how you feel in the morning. This is the perfect way to earn a decent money: to so something that you believe in. Like in your case: selling aloe vera and bee products. If you believe in their efficiency, your job is a pleasure all the time. Right? I know aloe vera is a miraculous herb for our body, just like honey. Laura! I’ve always really liked honey. Sometimes I’ll just take a spoonful to take away my “sweets” craving. Sometimes I’ll take a spoonful just because I like honey! I’ve always heard that honey is a good natural remedy to a lot of things, but this post is actually really informative! Another thing that I have heard a lot, and that actually makes a lot of sense, is that if you eat locally grown honey it will help with seasonal allergies? Have you heard of this? Is it true? I’m asking because I have REALLY BAD pollen allergies and right now my allergy medicine literally costs about $1 a day! Yes, it’s true. Honey and pollen can heal your pollen allergies. There are some conditions though, to buy honey made in the area of flowers that you are allergic at, to continue taking it with several month before the allergenic season begins (during winter), to take a precise quantity…. I will put an article soon on this, and let you know. Please let me know when you post that article! I am super interested in it as I am sick of my seasonal allergies! Here it is: Can honey treat allergy? Is it true? Please leave a comment if you want to ask something. I hope you will find a way to cure that allergy of yours. Sweet! I will check it out now! For tonsillitis I take propolis tablets. Like 3 per day, and keep them in my mouth for an hour. Propolis is the best treatment for throat and tonsillitis. Wow, you’re a home remedy genius! Propolis is great! That’s the only medication I really like because it’s natural. Speaking about salt and water, when my husband has a cold he clear his nostrils with it. brrr… Inhales that water through one nostril and exhales it through the other one. I found this quite dangerous, never did it, never will I do it! But, he knows this for a long time and it always helped, so if can do it, then good for him, right? I follow your site, too, you’re doing a good job there, a true inspiration. Yes! I’ve heard of that too. I do it as well but I’m helped by a rinse bottle. I actually bought a kit by SinusMed. It makes is a lot easier and salt water really good for congestion and sinus. So it is serious! I’ll check that company on the web. Make my husband’s life easier. 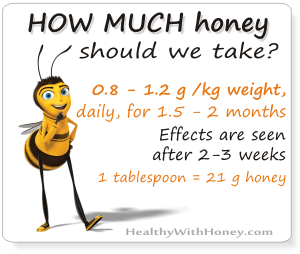 Hi, I always use honey when I have a sore throat, but was unaware it could be used to treat other ailments. Excellent article i will be sure to try these out for myself. I knew honey was good for you but now I have a wide variety of ways to actually make use of it. Thanks for all the information especially as we are coming into cold season and I know we will be needed some cold cures. Honey is GOOD for us, as long as we have the “good honey”. Please make sure you buy honey from your locals or organic shops. 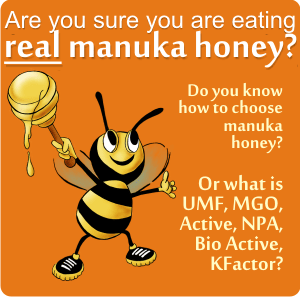 And also you can check these articles here: Organic honey vs Regular honey and What is fake honey. Natural cold remedies are now the most sought out for. This is an amazing article you have here, and I will pass it on to many I know. 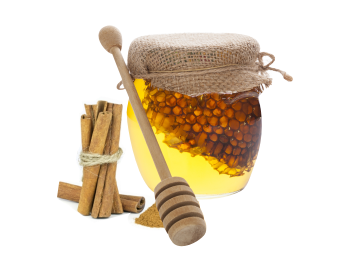 The winter is near and these cold remedies with honey are my favorite. Thank for all the details! Very impressive! Thank you too, for visiting my site.